Shocking evidence has uncovered the existence of "blood farms" in the U.S. as well as in countries like Argentina and Uruguay. Blood farms are a high dollar enterprise where "donor herds" of horses are kept for blood extraction purposes only. The blood drawn from the horses kept on these farms is used by companies throughout the U.S. and abroad for a variety of applications such as biological research, diagnostic manufacturing and veterinary drugs. 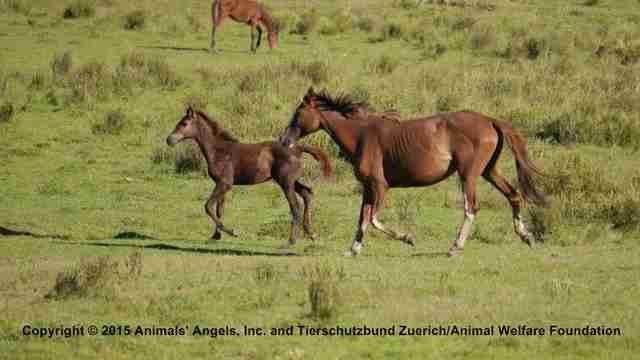 The blood taken from pregnant mares is especially in high demand, because it contains a precious hormone used to produce a veterinary drug needed by the pork industry. PMSG, or Pregnant Mare Serum Gonadotropin, is the main ingredient of several products that will artificially induce heat in weaned sows to achieve a faster and more regulated reproduction. 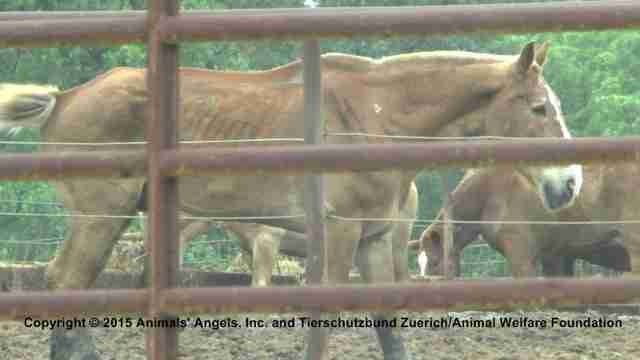 Emaciated mare at a blood farm | Animals' Angels Inc.
AA determined that several U.S. companies are involved in the trade, some even maintaining their own herds for collection purposes. Others purchase the finished product from their international affiliates, who in turn obtained the PMSG straight from sources in Argentina or Uruguay. While a relatively unknown industry, the horse blood trade is a huge business. For instance, Syntex Uruguay SA, one of the largest producers of PMSG, exported $8 million dollars' worth of the product to the EU in 2014 alone. Terrified horse at Syntex blood farm | Animals' Angels Inc.
A horse should have just 15% - 20% of its total blood volume taken during a 4 week period. However, no regulations are in place to ensure that not more blood is taken. Former workers report that it is common practice for 10-12 liters to be taken in a single extraction which can lead to hypovolemic shock and even death. Undercover footage from Argentina seems to confirm this, since a mare was seen collapsing and struggling right after blood extraction. 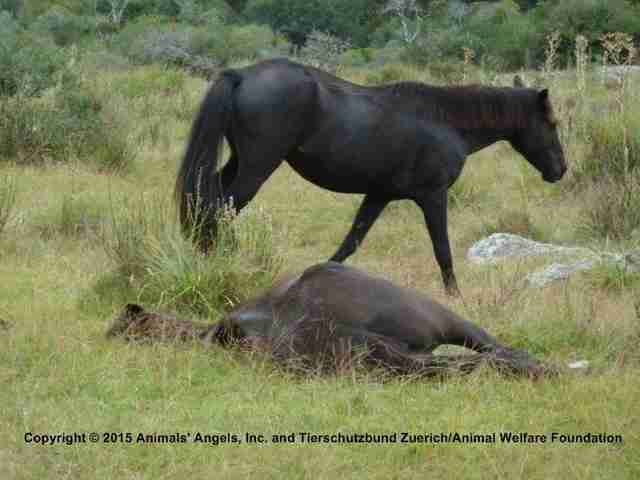 Exhausted horse after blood extraction | Animals' Angels Inc. 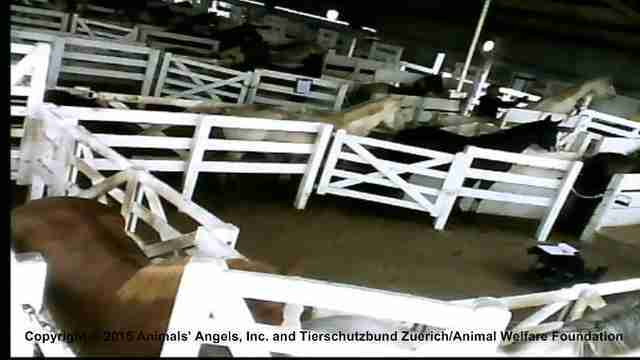 Horse being shocked with electric prod at Syntex location | Animals' Angels Inc. When it comes to regular horse serum, a company called Central Biomedia located in Missouri is of particular concern. The donor herd at this location has approximately 200 horses made up of Draft geldings. 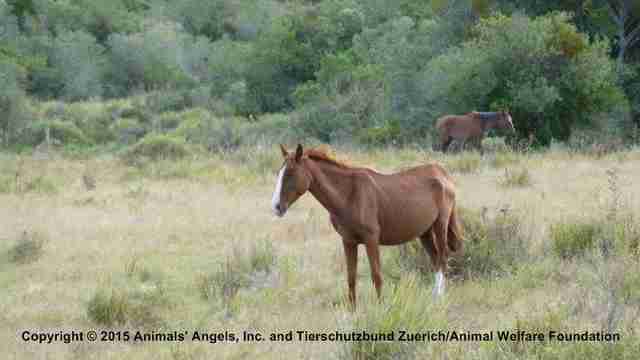 Although the company's website espouses the conditions under which the horses live, Animals' Angels investigators witnessed different circumstances indeed. Thin Draft horses with ribs showing and horses struggling to walk through muddy pens as they sank into the muck well over their ankles weren't exactly described in detail on the website. In addition it is of great concern that these horses, like at so many other blood farms, might end up at slaughter when their usefulness has ended. Draft horse at Central Biomedia location | Animals' Angels Inc. 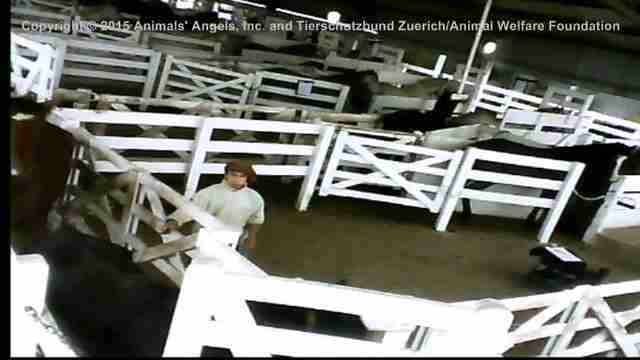 But worse yet, as with other blood farms, these horses are "invisible" as is the facility. They operate with seeming impunity. USDA/APHIS does not carry out welfare inspections or in fact, any type of inspection at these blood farms, since the Animal Welfare Act does not apply. This is obviously a serious gap in the enforcement aspect that needs to be corrected immediately to provide the protection these animals deserve. To learn more about this issue, please read AA's in-depth report. For more information on Animals' Angels and their extensive advocacy work, please visit their website.